There are more and more stabilizers for small cameras on the market. Many are Chinese, but unfortunately the designs are lacking. 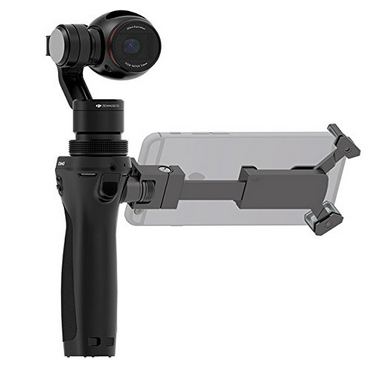 There are also gimbals for smartphone cameras, but again not many good reviews. The DJI Osmo is a step up in design. It features a 4K camera module very much like the camera in the Inspire 1, DJI’s top-of-the-line quadcopter. The Osmo can use a smartphone as a side-mounted viewfinder/monitor. Like the DJI drones, the Osmo has a well-thought out companion app for this dedicated camera/gimbal. The DJI Osmo 4K Cam With Built-In Hand Held Gimbal is a great step forward. This gimbal does a great job of stabilization and that’s the whole point, isn’t it? Take a look at this walking shot. Doesn’t get much better than that. In fairness, it might take a little practice to make it this smooth, but not much. The built-in stereo mic are not very sensitive. Unfortunately the audio gain cannot be adjusted through the app, but you’d want to record audio separately anyway. 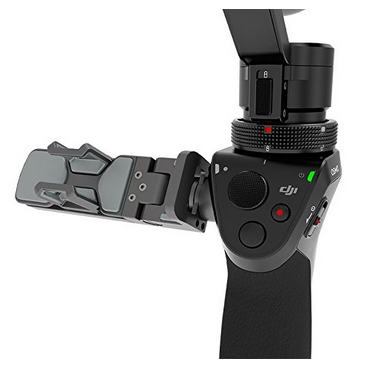 The Osmo system from DJI combines the Zenmuse X3 camera/gimbal with a detachable handle. The Zenmuse X3 module is built with the Sony 1 /2.3-inch 12-megapixel sensor. It can record 4K video at 24fps or 30fps. The maximum video bitrate is 60 Mbps. A built-in fan keeps it from overheating. The camera can record up to 120fps at 1080p. The lens is 20mm f/2.8 with a 94-degree field of view. The wide-angle lens is slightly soft close to the frame lines, but it’s not very noticeable. Curiously, the Zenmuse X3 module is not completely interchangeable with the Zenmuse X3 module on the Inspire 1. The module on the Inspire 1 works with the Osmo, but not vice versa. But if own an Inspire 1, you can simply purchase the $269 Osmo handle kit (battery, charger and phone holder included) and use it with the drone’s camera. As a still camera it can do 360-Degrees panoramas. Just hold the Osmo above your head and tap the shutter. 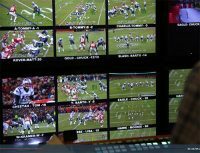 The camera will rotate, capturing images as it goes and it stays completely level. The camera is not great in low light. The Osmo camera is compatible with the higher-end Zenmuse X5 and X5R gimbals, but you will need to buy an adapter for them. The micro SD card (Class 10 or UHS-1) is inserted in the gimbal. The handle houses the stereo mic and includes a 3.5mm audio jack. The battery slips in from the bottom. There are buttons and LED indicators close to your thumb and index finger. The design of the handle makes it a very comfortable hand-hold. With the buttons you can center the gimbal, switch from still to video, lock the orientation, and even move the camera back for a selfie. When you hold it still, it’s hard to tell it’s not on a tripod. The DJI Go app runs on both iOS and Android. The software is not required to operate the Osmo, but it does allow you to set frame rate, resolution, white balance, ISO and exposure compensation. To link your phone just use the gimbal’s WiFi hotspot and load the app. The package includes a lens cap, a wrist strap, as well as a carrying case. DJI offers an additional bike mount, a vehicle mount and other accessories. While the list price is $649, it is available on Amazon for $569.00. It makes very stable video. This easy-to-use rig could replace dollies and steadicams as well as speed production. I think you’re much better off recording sound separately with a Zoom recorder or something similar. Even if the audio on the Osmo can be made to work you are still stuck with the mini plug connection which in itself can degrade the audio a lot. The unbalanced mini plug will also pick up interference.